West Windsor, N.J. - Journey to working class London with Mercer County Community College Theatre students for the coming-of-age drama "Beautiful Thing." Dates and show times for this bittersweet Jonathan Harvey play are Friday, Dec. 9 at 8 p.m., Saturday, Dec. 10 at 2 p.m. and 8 p.m., and Sunday, Dec. 11 at 2 p.m. Presented by MCCC's Theatre and Entertainment Technology Programs, performances will be held at Mercer's Studio Theatre, located next to Kelsey Theatre on the West Windsor campus, 1200 Old Trenton Road. Jamie and Ste (short for Steve) are teenage neighbors in a housing project in London. Jamie is bookish and shy, while Ste is more the athletic type. Neither boy has an ideal home life - Jamie's mother Sandra is financially strapped and disappointed in love, while Ste is engaged in increasingly heated battles with his father and brother. The two boys find common ground and begin to realize their feelings run deeper than simple friendship. As they come to accept important truths about themselves and their relationship, the play's hopeful ending suggests a more honest and tolerant future for all concerned. Written in 1993, "Beautiful Thing" was adapted into a film in 1996. The cast includes: Dan Johnson of Ewing as Jamie; Taylor Pickett Stokes of Trenton as Leah; Rachel Garretson of East Windsor, understudy for Leah, Nicole Erkoboni of Lawrenceville as Sandra; Christian Di Tullio of Lawrenceville as Steve; and Mike Miele of Belle Mead as Tony. 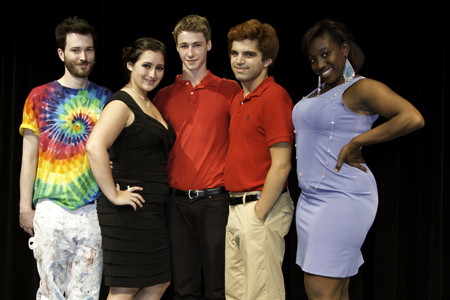 MCCC's Entertainment Technology students will assist with lighting and sound. Information about the Entertainment Technology program is available here. The bookish Jamie (Dan Johnson), left, and the athlete Steve (Christian Di Tullio) find common ground and more. 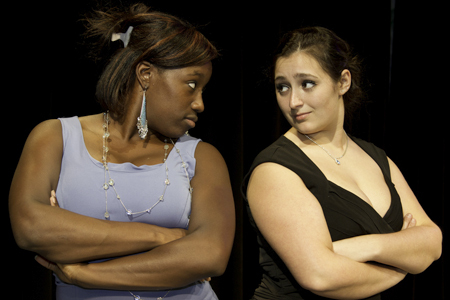 Neighbors Leah (Taylor Pickett Stokes) and Sandra (Nicole Erkoboni) are at odds. A happier ending for all, from left, Tony (Mike Miele), Sandra (Nicole Erkoboni), Jamie (Dan Johnson), Steve (Christian Di Tullio) and Leah (Taylor Pickett Stokes).